There’s a particular satisfaction in spending a day out walking knowing that you didn’t use a private car in the process. And if you live in Sulmona or are based there for a while then it is very achieveable. The Sulmona valley has a well-established public transport network and a walking holiday here for a couple of weeks without a car is absolutely possible! 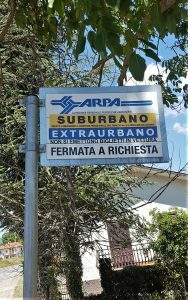 Every walk description in our catalogue has information on how to access the start point from Sulmona by bus and / or train. In fact, we have designed routes to take advantage of the network. The more we think to use it the more we help to sustain and develop it as well as make our small but positive contribution to looking after the natural world we love. It all adds up! Let’s begin with buses as they are the mode you are most likely to use. Point number one is that there are three separate networks operating at different levels – urban, suburban and interurban. 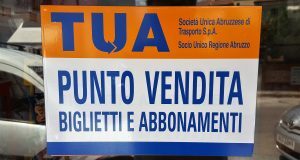 Urban services are run by the local council, suburban services by TUA (Transporto Unico Abruzzese) and interurban services by TUA and a number of private licenced operators. So, now to the ones that, for Sulmona Valley walking, matter the most. 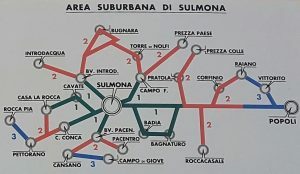 This is the map of the extensive Sulmona valley suburban bus network. It’s good and nearly all the villages are served. Wondering what the colour coding and numbers mean? It’s all about fare stages. The network is centered on Sulmona – green is the inner stage, red the middle stage and blue the outer stage. You pay for the number of stages you travel in; the digit just confirms how many stages a destination is from Sulmona. So, for example, Casa La Rocca is a one stage ride from Sulmona, Pacentro is a two stage ride and Vittorito is three stages away. You buy tickets for the number of stages you need for your journey and they must be bought in advance. 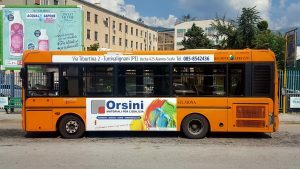 (This is also true for Sulmona’s urban buses.) You can get them typically from bars, newspaper kiosks and tabacconists – there are over 30 outlets in Sulmona so you are never far from one. They often, but not always, have the following sticker in their window. If you need a ticket and are in a bar or tobacconist ask anyway – chances are they have them. This is what bus tickets look like for the suburban network. These examples are for two fare stages (tratte). All journeys are one-way and end when you get off the bus. You’ll need another ticket to get back again. You must validate your ticket by stamping it with the date and time when getting on the bus. The arrow on the ticket shows the end to push into the stamping machine, which will be just inside the bus door and is often yellow. If you are found to be travelling without a validated ticket you may be fined. And the last but most important words on buses – how do I find out the times, routes and stop locations? It’s easy as long as you can connect to the internet (and you probably wouldn’t be reading this if you can’t). Quite recently TUA launched a new website for searching for bus connections and you can see it by clicking here. And a massive improvement it is, too. Hooray! You specify the two places you want to travel between and the date and departure time and then press search. The website returns a list of all the connections available from then on – departure and arrival times and stop names, service number and number of stops. It also gives any changes you may have to make. If you then click on a connection for more details, you can see all of the intermediate stops and, on a map, the line of the route. If you zoom in on the map, you will see exactly where each stop is. My advise is use it! Note that the TUA website won’t tell you if a connection it has listed terminates at your destination (likely to be a suburban service) or just stops there on the way to somewhere else (likely to be an interurban service). For example, the 13:04 for Pettorano is actually the service between Sulmona and Castel di Sangro. Be aware that the destination name on the bus isn’t necessarily where you are getting off – just ask the driver if you are unsure. Now it’s the turn of trains. Sulmona is a historic railway hub and we are blessed in the valley by having four separate lines that radiate from the town. (Ok, one of these, to Castel di Sangro, no longer has a scheduled service but it’s fully operational and is used frequently for very popular themed railway specials. These may not be of particular use for getting to and from the start of a walk but you might find them a lovely way to spend a day with your feet, more or less, up.) The other lines go to Pescara, Roma and L’Aquila. All train services are operated by the national rail company, TrenItalia. 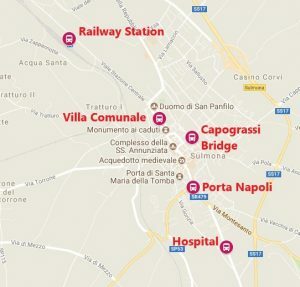 Pratola and Popoli stations are on the line to Pescara; Raiano station is on the line to L’Aquila and the others are on the line to Rome. Services to Raiano all begin in Sulmona. Services from Rome and Avezzano to Pescara pass through and stop at Sulmona and then also call at Pratola and Popoli. 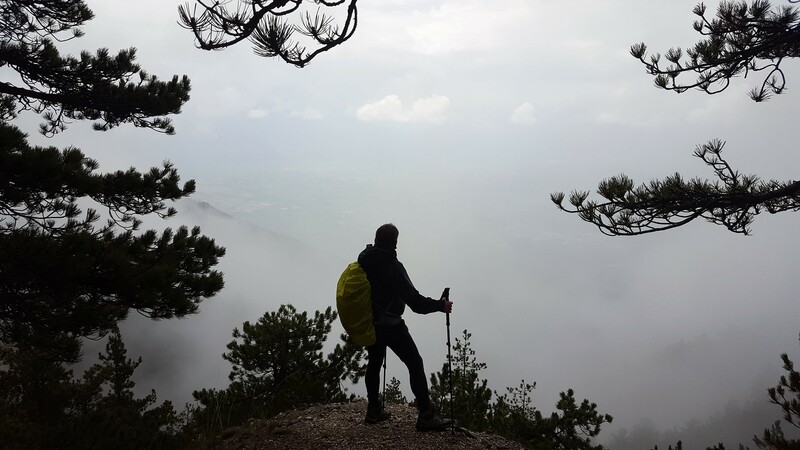 In addition other services for Pratola and Popoli begin in Sulmona. 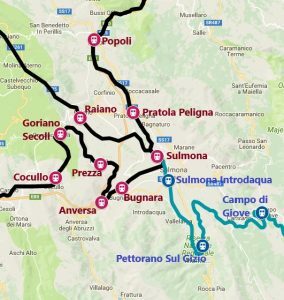 Conversely services from Pescara to Rome and Avezzano pass through and stop at Sulmona and then some also call at Goriano Secoli and Cocullo. In addition other services for Goriano Secoli and Cocullo begin in Sulmona. Currently there are no scheduled services for Bugnara, Anversa and Prezza. However these stations have been served in the recent past from Sulmona so I suggest checking the TrenItalia timetable before your planned day out; hopefully the situation might have improved. 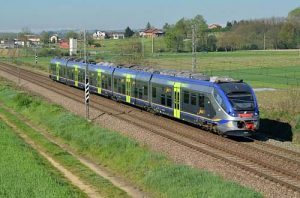 The frequency of trains on weekdays and Saturdays is pretty good between Sulmona and Pratola, Popoli and Raiano, with up to 16 trains a day to Pratola and Popoli and up to 12 to Raiano. It’s not bad to Goriano Secoli and Cocullo either with 5 on weekdays and Saturdays. Services are reduced on Sundays. Check the times of trains using the Trenitalia website here. Train ticket prices in Italy are cheap and will probably feel like a bargain if you come from somewhere else. 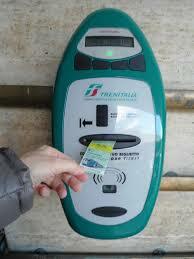 Currently a single from Sulmona to Popoli or to Raiano is €1.90 and to Goriano or Cocullo is €3. You buy your tickets at the station before you board. 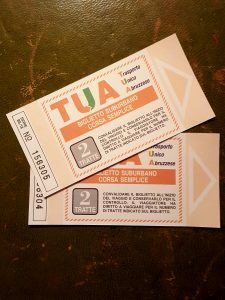 At Sulmona station you have the choice of using the ticket desk or one of a number of ticket machines. The machines will display English if you select this at the outset of your transaction. So, our User Guide is almost done! Already you are feeling more than confident enough to use public transport in the valley. Great! Orso’s website is here. There is a contact form. 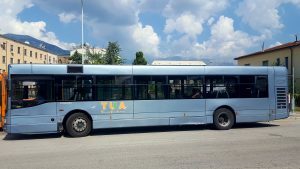 2 response to "Public Transport in the Sulmona Valley – A User Guide"
Great guide! I’ve tried to find buses online from Naples to Sulmona for tomorrow 16th April returning on Friday 19th, but can’t find any. 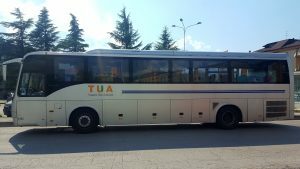 Do you have a bus company name as TUA doesn’t have anything schedulled online. Hi, so sorry, your comment got caught in the anti-spam filter! Though it may be too late this time, check this link for the timetable of coaches between Sulmona and Naples. The operator is Satam.